The above comments reflect the difficulties confronting the worker in organic soils. The lapse of time between the investigations of the 1960s and the frustrations of the FAO in 2011 is revealing. According to Bascomb et al. (1977): “Consistent characterisation of peaty materials is a prerequisite of any satisfactory classification of peat profiles”. Yet organic soils have not been well served by description or analysis, and man-modified organic soils even less so. Standard classification systems either allow no place for them at all, or fail to pursue their description to usable field scale. Conry and Diamond (1971) were Irish researchers, and among the very few to even note the existence of human-modified agricultural soils on an organic base; after conducting an exhaustive review of nomenclature, they finally conclude that whether the soils should be classified as Inceptisols or Entisols is ‘not of major significance’. Although almost all classifications produce ambiguity at the first (Order) level, it is now usual to accept the USDA classification of organic soils as Histosols. 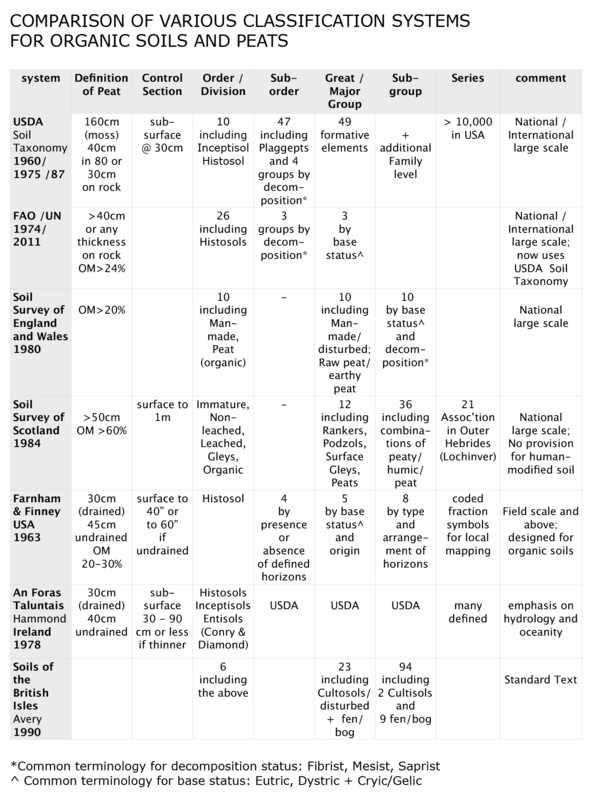 The table below compares the four major English-language systems, plus three that have explicitly considered highly organic soils and peats. 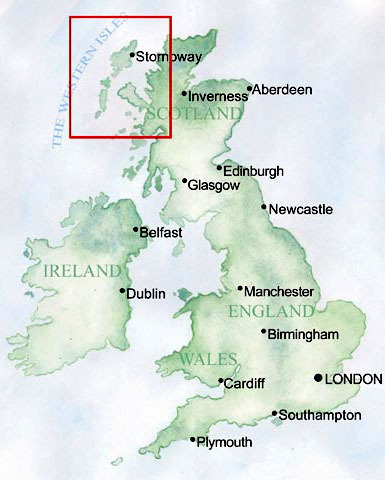 The Soil Survey of Scotland (1984) identified the soils now referred to as Blackland as peaty, peaty podzol, peaty gleys and peaty rankers. The Soil Survey made no provision for the human-modified soils which are common in the islands and west of Scotland, spanning a wide range of grazing and agricultural history. It also stated categorically that ‘land use is restricted to poor rough grazing’, although clear remains of cultivation practiced until the 1960s are apparent throughout the area. R.W. Avery (1990) considered peat soils ‘as distinct from mires in their entirety’. Farnham & Finney (1963) stated: ‘Most of these systems are concerned with classifying bogs…rather than three-dimensional bodies of organic soils.’ However, Avery also noted that in the Irish and the Scottish systems, both bog and mire have traditionally been used as soil type names. R.F. Hammond (1978), referring to the mapping of Irish peatlands, defined mire as ‘a wetland ecosystem where peat accumulates’. He went on to state: “The terminology used to describe large formations of organic debris is numerous, e.g. bog (red bog, black bog), bogland, peatland, peat, turf, moss, moor, peat deposit, moory soils, mire, organic soils, histosols, hochmoor, fen, swamp, marsh, raised bog, blanket bog”. Hammond viewed the word bog as the native Irish term bogach (meaning a quagmire bog), and mire as current international usage. Ilnicki (2003) stated: ‘In Poland, a wetland showing peat accumulation is designated a mire for undrained, or as a peatland for drained, conditions”. Once recognising that mire/bog and their subdivisions properly describe landscape units rather than soil types, we can consider them as contributing to the classification process rather than defining it. – Fen soils were formed from reeds, sedges and woody species; they are minerotrophic (eutrophic or mesotrophic). – Bog soils arise from mosses and Cypraeceae; they are ombrotrophic (oligotrophic/dystrophic) with lower pH and lower ash. This group is subdivided into raised (over deep peat) and blanket (on acid mineral soils). Farnham and Finney (1963) noted that ‘botanical origin is perhaps the most widely used criterion in organic soil classification’. However, Bascomb et al. (1977) noted that ‘soil groups separated on the basis of supposed botanical parent material have wide and overlapping ranges of values for measurable intrinsic qualities affecting utility as soil.’ Avery and the Soil Survey of England and Wales classifed soil groups and subgroups by the degree of decomposition and other measurable properties of horizons at specific depths. These terms are often used to describe forest soils. Avery also cites the terms ‘moulding’ or biological ripening used by Jongerius. The term moorsh or ‘moorsh forming process’ (MFP) is described in a number of technical papers published under the auspices of the International Peat Congress (editors L.E. Parent and Piotr Ilnicki, 2003). Okruzko proposed MFP in 1993 as ‘peat transforming into grains and aggregates’. Brandyk et al. 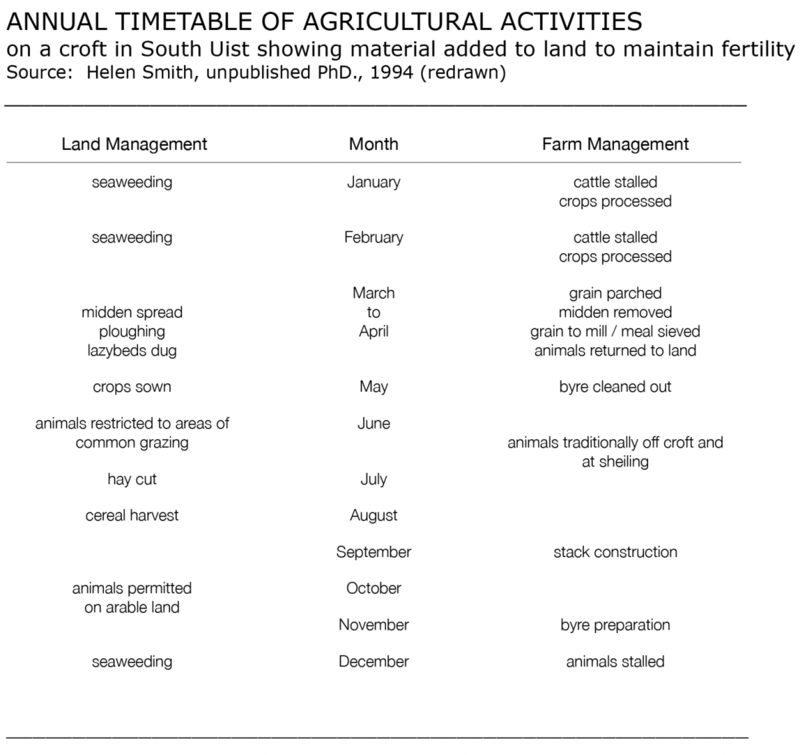 (2003) state ‘the moorshing of organic soils comprises biological, chemical, and physical changes driven by a decrease in water content and an increase in air content’. Okruzko and Ilnicki (2003) distinguish two processes taking place in organic soils: paludification (peat accumulating) and decession (peat mineralisation) with moorsh forming. Even though the above work in Poland appears to have taken place primarily in fen ecosystems, at least the concept of MFP is an effort to explain observable processes in organic soils. Unlike classification of mineral soils which is based on genetic, textural and structural considerations, other parameters are used for organic soils. The FAO lists 6 types of classification systems: topography/geomorphography, surface vegetation, chemical properties, botanical origin, physical characteristics, and genetic processes. Specialist methods and indicators are particularly useful for organic soils, particularly the von Post Humification Scale. Various methods of measuring decomposition were evaluated by McDonnell and Farrell (1984) and correlated with a standard (solubility in pyrophosphate extract); methods reviewed included the von Post scale, various rubbed/unrubbed fibre tests, bulk density and others. The review concluded that the von Post scale was invaluable for the field and correlated significantly with the standard and with ash. However, the authors noted that while von Post is preferable for unmodified soils, the RHOA rubbed fibre method performs better for modified. They also warned that the von Post method is of ‘no value’ in peats modified by mineral additions, although the context of this remark implies plaggen-type management. However, the FAO now uses the USDA Soil Taxonomy system which condensed the 10 von Post levels into three (fibrists, mesists, and saprists), while simultaneously noting the need for greater precision at management level. This example suggests that the detail necessary for description at field level may conflict with the drive for large scale mapping. The Ellenberg Species Indicator Values are a well-known ecological tool which uses plant species distribution to indicate soil characteristics; they are relevant for all soils including organic. Since plants must grow in the same spot for their lifetimes, and are adapted to quite small ranges of essential soil qualities, species distribution is a precise and multi-variant indicator of underlying soil conditions. The Ellenberg values thus serve as bio-indicators for various soil properties and environmental conditions; they are based on a complete data-base of species preference developed in Germany in the 1950s. As adapted for Britain by M.O. Hill et al. (1993), the Ellenberg values enable evaluation and comparison of underlying soils across a range of properties, such as pH, wetness, nutrient levels, and salt. As with the von Post scale, Ellenberg values provide a quick and sophisticated reading of general soil conditions with a high degree of local precision. The hydrology of organic soils and peats presents extreme values for both permeability/hydraulic conductivity and porosity as compared with mineral soils, as well as conditions such as anisotropy (differing rates of vertical and horizontal conductivity). Many researchers note that soils exhibiting diplotelmic (acrotelm plus catotelm) structure do not conform to classic soil hydrology; some question whether such soils even obey Darcy’s Law. Brandyk et al. (2003) noted a ‘decrease in hydraulic conductivity with increasing depth of sphagnum peat’; and that it varies with degree of peat decomposition. Rycroft et al. (1975) discussed the operation of soil water as a regulator of root aeration and mineral nutrition, and also suggest that ‘the very notion of hydraulic conductivity may not be applicable to humified peat’. They quoted Aiton who in 1811 advocated shallow drains (as opposed to deep ditches) for the rapid removal of surface water because the ‘moss is a substance so close and compact as to prevent water from filtrating through it’. Rycroft went on to provide examples of anisotropy, with examples up to a factor of 13 in both vertical and horizontal directions. The work also cited findings of strong negative relationships between humification and conductivity. Proctor et al. (2009) also noted that hydrological conditions correlate with species distribution, and found a ‘highly significant correlation between species occurrence and the ombrotrophic / telluric division’; this study included species common in the study area. Schulte et al. (2012) reviewed the impact of excess soil moisture under Atlantic, oceanic conditions on soil functionality and agricultural sustainability; they noted that the standard agricultural measurement of soil moisture deficit (SMD) is not an appropriate indicator of wetness. Russian scientists (Skoropanov, 1961) emphasized that ‘drainage is crop insurance’. This term is used to describe hydrologic sequences of soils with differing moisture regimes (Avery, 1990). It refers to association on the basis of drainage or differences in relief; Buckman and Brady (1969) noted that it is ‘very helpful in practical classification of soils in a given region’. Many systems of classification require identification of a control section to define the depths at which the soil is to be described; this definition varies from system to system. Some require removal of the surface vegetation before measurement, others begin at a fixed depth, or require that a diagnostic layer reach a minimum thickness. Definition of the control section has considerable effect on description of anthropogenic soils. Buckman and Brady (1969) described soil as ‘ a dynamic natural body on the surface of the earth in which plants grow, composed of mineral and organic materials and living forms’. Jenny (1980) defined soils as ‘dynamic natural bodies whose properties reflect the environment in which they have been formed’. It is important to differentiate between soil defined by its constituent elements at a given moment (a natural entity formed over geologic time) and soil as a system susceptible of profound change through human intervention over a few lifetimes or less. The Soil Survey of England and Wales recognises this distinction through the sub-order of ‘earthy peats’. Soils as modified by humans are described as anthropogenic or anthropic. These authors described this process in Orkney and Shetland. Dutch and German scientists took the lead in the early 20th century in describing and classifying anthropogenic soils in Northern Europe, laying the groundwork for later research. Glentworth (1963) also observed anthropogenic soils in Scotland. These authors described plaggen as a man-made layer occurring over a less fertile sand or glacial till. However, Conry in his work in Ireland (1972) described heavy peaty soils in the Dingle Penninsula, Co. Waterford, which had been amended through use of shell sand and seaweed. In both cases, the soils were described as substantially increasing fertility over their unmodified neighbors. Fraser Darling (1945) discussed depth of cultivation as key to working the soil to aerate and improve it; he cited the value of the old cas-chrom (foot plough) in deepening the horizon as more effective for this purpose than a modern drawn plough. Study of anthropic soils in Scotland is still in the very early stages. Research in northern Europe has historically focused on a built horizon over a free-draining till. Conry attempted to broaden the definition to include the sand-modified peat he observed in Ireland. Glentworth provided a sympathetic over-view of agricultural systems in the Hebrides. Davidson et al. investigated deep topsoils through field and laboratory analysis. However, research in Poland (Okruzko & Illnicki, 2003) proposed permanent structural, chemical and biologic changes in organic soils, brought about by human intervention through agriculture; this transformed soil was termed moorsh. The present research aims to clarify the nature of blackland as a form of modified soil and management system which has much in common with Conry’s observations and with the concept of moorsh.